Soft shape sorter with 9 pieces to match. Three clear plastic shapes with beads, 3 vinyl animal shapes plus 3 textured fabric shapes. Shape sorter teaches color, shapes, matching, counting and more. 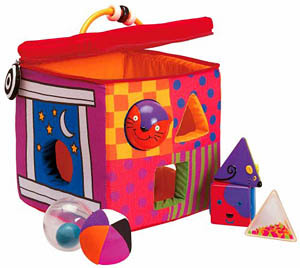 Shape sorter has handle and zipper for easy storage.